Signature Group Holdings, Inc. is a diversified business and financial services enterprise that invests in the industrial and commercial marketplace, primarily in the United States. Signature focuses on generating strong, risk-adjusted return on equity while protecting shareholder capital. The company also supplies commercial, industrial and residential circuit breakers to the replacement market through its subsidiary, North American Breaker Company. Signature Group Holdings is based in Sherman Oaks, California. As a consulting firm, Signature Holdings has a very small IT department. The company has a few dedicated network and systems engineers, but most of the staff members who support IT have other responsibilities. As a result, Signature works with several service providers for IT support, including Computer Technology Resources (CTR), a member of the Amazon Partner Network (APN). When Signature decided to replace its outdated on-premises ERP system with Oracle E-Business Suite, the company turned to CTR for the implementation. Signature wanted a SOX-compliant environment that could be managed by a service provider and integrate into its existing infrastructure with minimum disruption. Signature also wanted a disaster recovery solution that would enable fast recovery. To set up Oracle financial modules on AWS for Signature, CTR provisioned an Amazon Virtual Private Network (Amazon VPC) to run the Oracle E-Business Suite (Accounts Payable, Accounts Receivable, Oracle Asset Management and Procure-To-Pay) on two extra-large Amazon EC2 instances. Amazon Elastic Block Store (Amazon EBS) provides high-performance, block-level storage for the instances. The storage volumes initially stored 300 GB of data, which has since grown to 600 GB over a period of 24 months. Oracle Recovery Manager (RMAN), a database backup and recovery manager, interfaces with Amazon Simple Storage Service (Amazon S3) to enable secure database backups. For disaster recovery, the primary environment runs in the US East (Northern) Region and has a backup site in the US West (Northern California) Region. Figure 1 below demonstrates the Oracle applications on AWS. 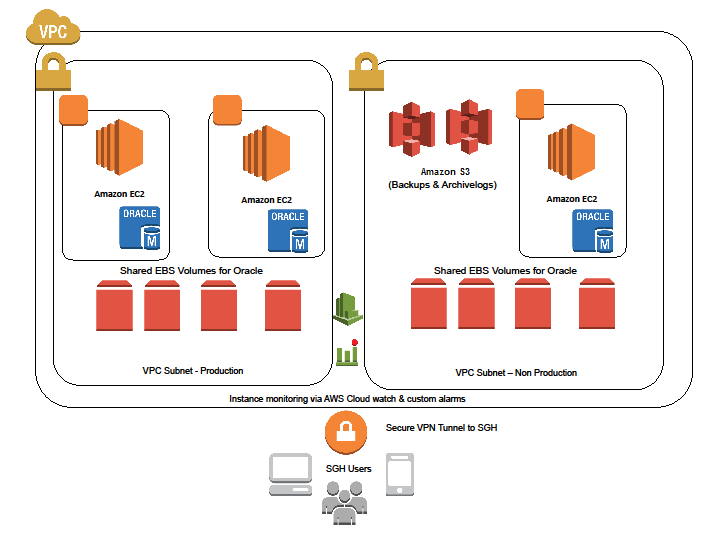 SOX auditors examine both the financial and technological aspects of the Oracle implementation on AWS, focusing on security, backup and disaster recovery. For the last three years, Signature and CTR has successfully passed the quarterly audits. A global system integration company dedicated to providing high quality and cost effective technology solutions. For more information about how Computer Technology Resources can help your company run on the AWS Cloud, see Computer Technology Resources' listing in the AWS Partner Directory. To learn more about how AWS can help your business application needs, visit our Business Applications page: http://aws.amazon.com/business-applications/. To learn more about partner solutions, visit our Partner Network: http://aws.amazon.com/partners/.